ISLAMABAD: Pakistan Tehreek-e-Insaf (PTI) Chairman Imran Khan on Sunday said his party and the nation will hold Prime Minister Nawaz Sharif accountable and announced to launch a movement against corruption from Sindh on April 26. Addressing the party workers and supporters to mark the 20th foundation day of PTI here at F-9 Park, Imran Khan also threatened street protest if the government failed to constitute an independent commission to probe Panama Leaks. “The nation will hold you accountable … they will take to the streets, if service of an international forensic company are not hired and terms of reference (ToRs) for the independent commission are not made in consultation with the opposition,” Imran Khan asserted. The PTI Chairman also announced to hold a rally at Chairing Cross in Lahore next Sunday. 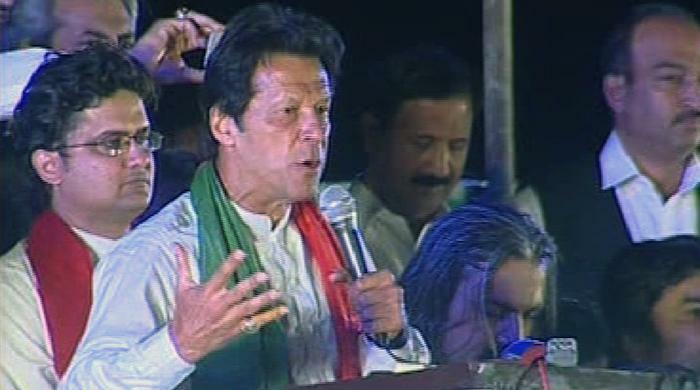 He said the PTI had demanded audit of votes in four constituencies but the Prime Minister did not take any action. “Later, it came out that rigging was carried out in all the four constituencies,” he added. Pointing to the Prime Minister, Imran Khan said ‘you came on TV twice but both the times you failed to give a satisfying answer. “Don’t say hold others accountable. You and your family’s names have come up in the Panama Papers. Mian sahib you will have to come up with the answers,” he reiterated. He regretted that instead of coming clean what PML-N did was to hurl counter accusations against others. Khan said if Pakistan Muslim League-Nawaz (PML-N) is really a political party then it should demand answers from Nawaz Sharif. The PTI chief said people are dying of hunger while ‘Mian sahib’ is launching metro train project. “The aim of such projects is to mint money through securing commission,” he alleged. Earlier, Imran Khan shared with the attendees of the rally what drove him to come to politics and recounted the struggle that went into building and organizing the party. “The Almighty had blessed me with a lot. But, the more you are blessed, the greater the responsibility upon your shoulders to give back to the people,” he said. He said he was always very shy and didn’t even know how to deliver a speech. “Even today when I look at my post-world-cup-winning speech I feel ashamed,” he added. The PTI Chief said the purpose of his coming into politics was to transform Pakistan into a country envisioned by Quaid-e-Azam Muhammad Ali Jinnah. “The aim is to build an Islamic welfare state where there is justice and respect for the mankind; where minorities have equal rights,” he added. Strict security arrangements were in place for the party’s 20th Foundation Day celebrations. The Islamabad administration had granted PTI permission for the rally on the condition that the event be wrapped up by 10:00 PM. People from the twin cities as well as other cities of the province had started arriving at the venue in the morning. The participants included a large number of women and children. Only one gate of the F-9 Park was used to allow participants inside the closely guarded venue.